Sticker Mule $100 Giveaway – Enter To Win! I think we can all agree that getting your name out there is important. For example, putting a sticker of your logo on your laptop when you go to a design conference or skin your iPhone with your own custom design can be a great way to get people to notice you! From laptop skins to die cut stickers, Sticker Mule makes it easy to order custom stickers and skins at very affordable prices. The good news is, we’ve partnered-up with them to offer a free $100 order to a lucky reader of SpyreStudios. Stickers are print and water resistant and printed on 6 mil vinyl. Their skins are easy to remove and printed on premium 3M vinyl. 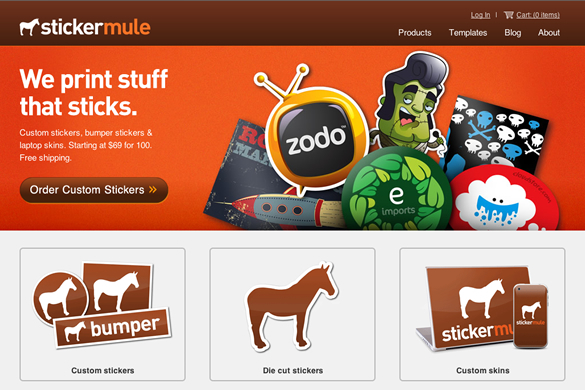 Sticker Mule also offers free shipping to US and Canada. To enter the giveaway simply leave a comment on this post (with your real name and a valid email address) and tell us why you would like to win and how you would use your stickers. You can also tweet about the giveaway, we will be tracking tweets using Disqus Reactions. We will pick the winner using a random number generator. The contest ends on Friday, January 28th, 2011 at midnight (0:00) GMT. The winner will be announced shortly after. If you simply cannot wait to order your stickers, you can use the following coupon code and you will automatically get a $25 discount: SPYRE25 – This coupon code is valid up until February 7, 2011. If you’re looking for an iPad, iPhone or laptop skin, or even die cut or custom stickers, make sure you pay Sticker Mule a visit. Also, don’t forget to follow Sticker Mule on Twitter! I’d love to win this to create some stickers using some of the characters I’ve created and share them..
Um, you guys are rad and so is this giveaway! Thanks for putting it out there. Who would not want? I ‘m in. Me likey stickers, me likey stickers! Count me in. I ♥ Stickers! Oh yeah ;) sweet one! I’m in ! I love to win some stickers. i’d use them to help spread the word about my start-up! I love stickers, especially when they’re free! I’d love to win $100 in stickers to highlight the nonprofit I work for: Family Service of Chester County (www.familyservice.us). We provide counseling and support to families in our community who are struggling with poverty, child abuse, mental health problems, disabilities, the HIV virus, and other “problems of living.” We work in a downtown area… I’d love to distribute the stickers to local coffee shops, bookstores, etc. I’d love to use this to get some stickers for the 2012 presidential election. I want to get some pictures for Obama/Biden (if Biden is up for another round of being VP). ..Made a very simple “portfolio brochure” site last year with my photography and graphic art. I want to try and take that to a commercial level this year and try and make a few bucks. That would of course include a new LOGO. I’d put my Sticker Mule winnings on EVERYTHING! I’d be using the prize to pay for some colorful packaging labels for my photo invitations. I can use it for publicity for my brand and for funny really.Great giveaway. Ooh stickers! Was just adding this to my list of to-do’s for my wedding! Lucky – whoever wins this one! Thanks for another awesome giveaway, SpyreStudios! Shiny stickers – everyone loves shiny stickers! My husband is starting a new business–this would be a great way to get the word out! I would like to win the stickers so I could promote my website more. I will have my logo and URL address printed. I can use it for promotion for my bussines and for funny really.Great giveaway. I’ve been following Sticker Mule for a while back when I got inspired about getting a laptop skin done. Yes, they’re great for that extra promotion when you are at a conference or cafe, but they also make great die cut stickers and those are always fun to share. Just started a new design studio. Promotion, promotion, promotion! In the process of signing a new client that is all about guerrilla marketing, & this would be right up their alley. i just gotta win this! there’s no better way to advertise my friend’s start up clothing business and my website that using these awesome Sticker Mule stickers! Cool! I’ll definitely stick these on my boring laptop!